visit Kinari bazar (Market for delicate lace, blingy borders and sparkly sequins) and finally take blessing from the lord from Gurudwara Sis Ganj (Sikh Temple). 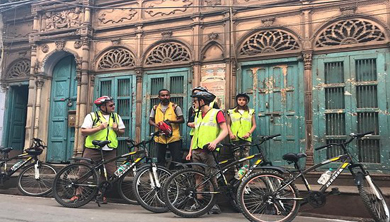 Witness the past and present glory of Old Delhi with this unique three-hour cycling tour of the area's 400-year old streets! Meet up with your guide, then hop on a modern bicycle before you embark on your unforgettable journey. Marvel at the interesting blend of past and present architecture as you cycle through the narrow streets and take in the scent of freshly-brewed tea and breakfast curry. Visit popular destinations like Jama Masjid, a large and magnificent mosque, and Chandni Chowk, one of the oldest and busiest markets in Old Delhi. Stop by the Red Fort, the main residence of the emperors during the Mughal dynasty, and get an amazing view of the surrounding area on the viewing point. Pass by Sadar Bazar, the largest wholesale market of household items in Delhi, and Old Delhi Railway Station, the oldest in the city. Old Delhi Food Walk Tour. sweet, sour, tangy and spicy all at the same time chutneys. Moving on, we will be entering one of the busiest and famous streets of Chandni Chowk, which serves deep fried Indian bread with the stuffing of your choice along with the perfect accompaniments. Next, we proceed to the bright colorful lanes of Kinari bazar paving our way through to Naughara- which translates into nine beautiful Jain mansions built and preserved from the 18th century. Walking and gazing through the narrow alleys of Dariba Kalan, one can enjoy endless antique jewellery stores on the way to our next food destination. Thereafter, have an amazing hot cup of masala chai while entertaining yourself with chaiwala's swag! Being close to one of Asia's biggest wholesale spice market, it is hard to miss out on abundant variety present there and is definitely a must visit place on the list. Any meal is incomplete without satisfying our sweet tooth and hence the tour will be concluded with assorted traditional Indian sweets. It is said that Delhi has many lovers in its history right from Mughals to British one such love story is shown at Old Fort New Delhi in the form of Sound & Light show called “Ishq-e-Dilli”. This 60 minute show which has been running from 5000 years of the Capital’s history makes his audience splendid. 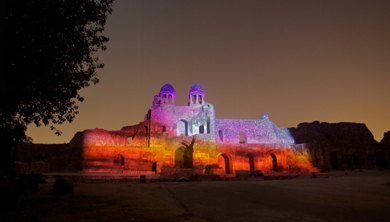 The show depicts a unique combination of light, sound & the history of Delhi through laser technology. It surly a fun way to see the journey of first city of Quila Rai Pithora through Qutab Mehrauli, Kilori, Siri, Tughlaqabad and many more to Modern Delhi. The Salaam Baalak Trust City Walk is an English guided tour of almost 2 hours conducted by kids who used to live in the streets of Delhi before joining our Trust. Our guides are adolescents who have been fully trained as local guide and who want to improve their communication and speaking skills. City Walk gets the children's stories heard, gives people a view of their world through their eyes. 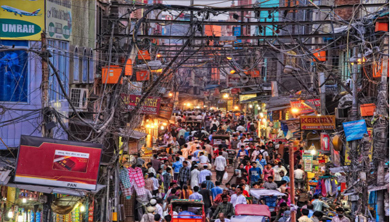 Walk tour through the streets of inner city of Paharganj and the area around New Delhi railway station, led by a child who was once living and working on the streets will experience special tour far from the tourist main attractions. City Walk is an example of how a volunteer's creativity can translate into a unique and enduring programme, which is both popular and economically viable. Over the last seven years, thousands have taken the Walk and empowered a number of children, helping them to join mainstream life. Salaam Baalak Trust English Speaking Guide. 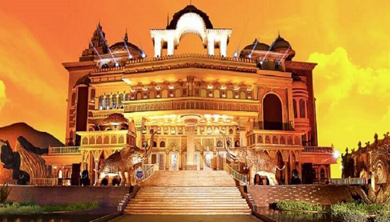 The ultimate entertainment and leisure destination, sprawling across acres of land, ideally located at the apex of the golden triangle of Jaipur, Agra and Delhi, is the magnificent Kingdom of Dreams. Here, the carnival that is India is distilled into one iconic destination. This fabulous Kingdom brings to life a blend of India's art, culture, heritage, craft, cuisine and performing art...all with the technological wizardry of today. Enjoy live show at Nautanki Mahal: showcasing an extravagant cinematic and theatrical musical. 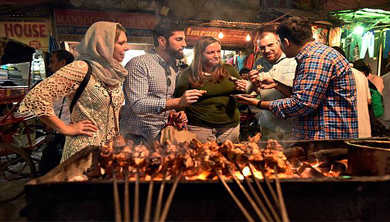 Later enjoy food from all over India at Culture Gully: an elaborate culture, arts, crafts and food boulevard. IIFA Buzz: a glamorous Bollywood themed cafe. This is a destination in itself which is capturing the imagination of the world. Get ready for this century's most novel tourist destination. different part of Indian 15 day’s rotational basis, so that each and every craftsman gets opportunity to place their things and products for sale. Visitors can also enjoy the authentic dishes served from different regions of India under single roof. 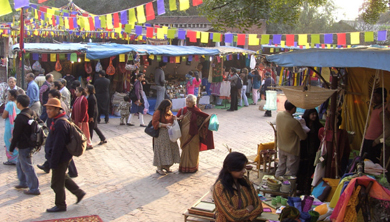 Dilli Haat is located at the commercial area of South Delhi and opposite to INA market on the Sri Aurobindo marg. 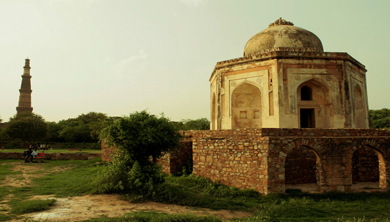 Mehrauli Archaeological Park is a space rich both in history and tranquility. Covering an area of close to 200 acres, it is one of the oldest areas in Delhi. The three hour Mehrauli Archaeological Park Walking Tour has been designed in a special way letting you see all of the important excavated remains tracing them through history and taking you to the times of Khalji, Tughlaq and Lodhi dynasties moving on to the reign of the Mughals and British colonization. Visit the “haunted” Jamali-Kamali Mosque, known for the numerous reported ghost sightings on its grounds and the stories associated with them. See the tomb of the English Nobleman, Metcalfe House and conveniently complete the tour at 11am. Cooking Class with Dinner / Lunch at Indian Family House. Experience the bold flavors of India in this New Delhi Cooking Class that puts travelers in touch with the lifestyle and traditions that are typical of India. 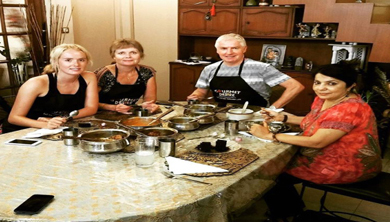 Learn about local life, arranged marriages and the value of family as your hear personal stories and learn to cook traditional Indian cuisine with a local family. Dine in the comfort of their Delhi home and share a meal as new friends.